Today marks an important day in history. Take a moment now to commit this day--the 5th of October in the year 2011--to your memories, for today is the day that I finished watching How I Met Your Mother in it's entirety in under two weeks. That's right. Five full seasons and the start of season six. 115 episodes. 45 hours. A lot of minutes. 45 hours of pure legen--wait for it--dary awesomeness. I chose to only include other activities that I couldn't do while watching HIMYM. This is why 'eating' is not a bar on the bar graph. 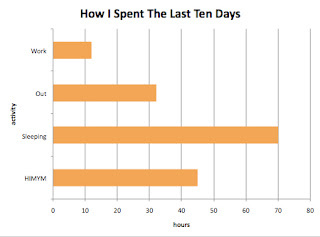 I spend a lot of hours eating, most of which I did while watchin HIMYM. Multi-tasking: it's important. Sleeping is also important. I might spend too much time sleeping, but that brings me to my next point: I didn't have a job last week. This also explains the minimal hours devoted to "work". I might have also counted "doing the dishes" as work. Obviously there are many more hours than what I've represented on the above bar graph, but I can't remember what I did. Clearly, it wasn't as important as eating, sleeping or watching HIMYM. 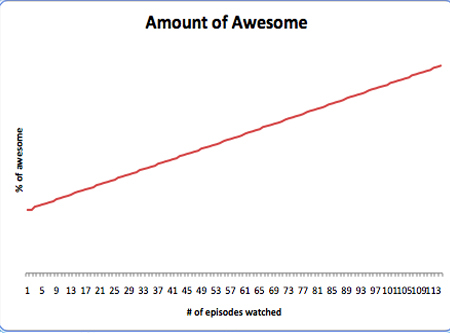 This line graph shows how my percentage of awesome has increased with each episode watched. My awesome level was already pretty high to begin with (that goes without saying, but I wanted to say it anyway), and it's only further increased. Now I'm almost too awesome for daily consumption. I'm sort of like that really expensive desert that Serendipity serves. Yes. I'm served in a gold plated dish and covered in expensive dessert cavier. Om. Nom. Nom. 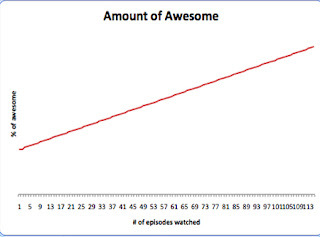 I have no idea why I only just started watching this show last week. Because it's really [one of] the best show[s] in the entire world (other shows being: Arrested Development, Gossip Girl, Alias, Mad Men and Frasier). I was trying to compile a list of my favourite episodes or moments, but it's just too hard. Between Robin Sparkles and Slapsgiving; from the misadventures of Swarley and Teddy Westside and Vanilla Thunder to figuring out what the difference between peanut butter and jam is; the challenges, the interventions, the high fives . . . it's all too good. I am rather fond of Barney's video resume, as it reminds me of that hilarious video resume that plagued the internet a few years back. Remember the douchery? And then Michael Cera spoofed it and it was glorious. And I'm -this- (yes, I'm holding my fingers really, really, really close together) close to having Let's Go To The Mall completely memorized. I'm also incredibly anxious to see what the short lived Canadian variety show that Robin Sparkles and Alan Thicke starred in together was like. Okay, I'm off to make more charts of things and to write letters to my future self. Also, I want to have an intervention. Who needs intervening with something? Since by now i am assuming you have gotten through season 6. tell me, what is the meaning of the numbers in one of the later episodes of the season? It was a game, just following the numbers. They started at a number and counted down. Just try to find them all. For the record, I missed number 7. Damn. That is impressive. I got through a season every few days when I powered through it. Then I rewatched it a few months later. I just had a post about some theories on who is the mother is, and it got posted on "YourMother" page on facebook. I think you should check it out! Also, I never noticed the number thing. I have to check that out. Oh, and Pork Chop, the number 7 is on the bottle Marshall opens to celebrate his fertility.